Gladstone /ˈɡlædstən/ is a city in the Gladstone Region, Queensland, Australia. It is approximately 550 km (340 mi) by road north of Brisbane and 100 km (62 mi) south-east of Rockhampton. Situated between the Calliope and Boyne Rivers, Gladstone is home to Queensland's largest multi-commodity shipping port. Gladstone is the largest settlement within and the seat of the Gladstone Regional Council, which formed in 2008 amalgamating three former local government areas. Before European settlement, the Gladstone region was home of the Toolooa (or Tulua),  and Baiali (or Byellee) Aboriginal tribes. In May 1770, the HM Bark Endeavour, under the command of James Cook, sailed by the entrance to Gladstone Harbour under the cover of darkness. Matthew Flinders, during his 1801–1803 circumnavigation of Australia, became the first recorded European to sight the harbour in August 1802. He named the harbour Port Curtis, after Admiral Roger Curtis, a man who was of assistance to Flinders a year earlier at the Cape of Good Hope. John Oxley conducted further exploration of the harbour and surrounding countryside in November 1823. Oxley was dismissive of the region, noting the harbour was difficult to enter, the countryside was too dry, and the timber useless for construction purposes. Nevertheless, in 1847 the British attempted to establish the new colony of North Australia at Port Curtis. Colonel George Barney was chosen to lead this experiment in colonisation and his expedition was eventful. On 25 January 1847, the Lord Auckland, carrying 87 soldiers and convicts, arrived off the southern entrance of Port Curtis and promptly ran aground on shoals off the southern tip of Facing Island. The settlers spent seven weeks on the island before being rescued by the supply ship Thomas Lowry and delivered the intended site of settlement, the region now known as Barney Point. On 30 January at a proclamation ceremony, Barney was sworn in as Lieutenant Governor of the colony of North Australia. The convict settlement lasted barely two months and cost the Imperial government ₤15,000. A change of government in Britain ordered the withdrawal of Barney and the settlers. However, interest in the region remained. By 1853, Francis MacCabe was surveying the site of a new town on the shores of Port Curtis under the protection of several detachments of Native Police. Maurice O'Connell was appointed government resident the following year, resulting in an influx of free settlers as land became available throughout the region. Gladstone State School opened on 1 April 1861 and is one of the oldest state primary schools in Queensland. On 14 November 1968 its name was changed to be Gladstone Central State School. In 1863, the town became a Municipality with Richard Hetherington elected Gladstone's first mayor. The fledgling town was named after the British Prime Minister William Ewart Gladstone and has a 19th-century marble statue on display in its town museum. Development of Gladstone was slow until 1893 when a meatworks was established at Parsons Point. Parson's Point Provisional School opened on 1 August 1898, becoming Parson's Point State School on 1 February 1913. The school was relocated and renamed Gladstone South State School in 1945. Gladstone State High School opened on 2 February 1953. Gladstone West State School opened on 24 January 1966. Rosella Park State School was opened on 17 May 1971. Clinton State School opened on 29 January 1974. Toolooa State High School opened on 27 January 1981. Kin Kora State School opened on 9 October 1981. In 1985 the Gladstone Christian Community School opened as a primary school operated by the Gladstone Baptist Church. In 1998, it changed its name to Trinity College. From 2013 it offered classes from Prep to Year 12. St Stephens Lutheran College opened in 1998, but closed at the end of 2016. The school had lost 20% of its enrolment due to families moving away to find work, leaving only 216 students in classes ranging from Prep to Year 12 making it no longer viable to operate the school. The Gladstone Library building opened in 2003. According to the 2016 census of Population, there were 33,418 people in the Gladstone urban centre. Aboriginal and Torres Strait Islander people made up 4.6% of the population. 76.0% of people were born in Australia. The next most common countries of birth were New Zealand 3.7%, Philippines 2.3%, England 2.1%, India 1.3% and South Africa 1.0%. 84.4% of people only spoke English at home. Other languages spoken at home included Tagalog 1.1%, Filipino 0.8%, Afrikaans 0.5%, Mandarin 0.4% and Hindi 0.4%. The most common responses for religion were No Religion 29.9%, Catholic 22.2% and Anglican 15.7%. 1950s view across Auckland Inlet before construction of power station. Gladstone and Rockhampton are the two major cities in the Central Queensland region. In the sister city program, Gladstone is twinned with the Japanese port of Saiki. Gladstone's primary industries are mining-related. The Port of Gladstone is the fifth largest multi-commodity port in Australia and the world's fourth largest coal exporting terminal. The port consists of a number of wharves and terminal facilities. Boyne Wharf is used by the Boyne Island aluminium smelter and was opened in August 1982. The western harbour basin has been expanded, primarily to allow increased exports of liquified natural gas (LNG). Furthermore, in 2016, a plant was constructed on Curtis Island to produce and export LNG, a construction project that contributed heavily to city's population and housing boom. Major exports include coal, alumina, aluminium, cement products, sodium cyanide and ammonium nitrate. Each year 50 million tonnes of coal passes through the port, making up 70% of the total exports. Gladstone harbor is within the World Heritage Area of the Great Barrier Reef and has historically supported a thriving seafood industry. Dredging in the harbor has led to high levels that pose a threat to seagrass beds and other marine life. In August 2011, a Fisheries Queensland spokesman said they received reports of fish with milky eyes. A spokesman from the Gladstone Fish Markets claimed that diseased fish were still being caught in large numbers in November 2011. Losses to the local seafood industry have been estimated at A$36 million a year. Gladstone is also a tourism destination, with cruise ships regularly docking at the port. Gladstone has a range of primary schools and secondary schools. Gladstone Central State School is a government primary (P-6) school for boys and girls at 74 Auckland Street. In 2017, the school had an enrolment of 342 students with 24 teachers (22 full-time equivalent) and 16 non-teaching staff (12 full-time equivalent). Gladstone South State School is a government primary (P-6) school for boys and girls at 153 Toolooa Street, South Gladstone. In 2017 the school had an enrolment of 330 students with 22 teacher (20 full-time equivalent) and 24 non-teaching staff (16 full-time equivalent). Clinton State School ia a government primary (P-6) school for boys and girls at Harvey Street, Clinton. In 2017 the school had an enrolment of 912 students with 64 teachers (59 full-time equivalent) and 46 non-teaching staff (28 full-time equivalent). Kin Kora State School is a government primary (P-6) school for boys and girls at 43 Hibiscus Avenue, Kin Kora. In 2017 the school had an enrolment of 801 students with 57 teachers (51 full-time equivalent) and 27 non-teaching staff (19 full-time equivalent). Rosella Park School is a government school for boys and girls aged from five to eighteen years who have moderate to severe intellectual impairments at 20 Park Street (corner of Rosella Street), West Gladstone. In 2017 the school had an enrolment of 75 students with 20 teachers (19 full-time equivalent) and 30 non-teaching staff (19 full-time equivalent). Due to the specialised nature of the school, its students are drawn from all over Gladstone and beyond into the wider Gladstone Region. Gladstone State High School is a government secondary (7-12) school for boys and girls at 30 Dawson Road, West Gladstone. In 2017 the school had an enrolment of 1509 students with 123 teachers (115 full-time equivalent) and 61 non-teaching staff (45 full-time equivalent). Toolooa State High School is a government secondary (7-12) school for boys and girls at 2 Phillip Street, South Gladstone. In 2018 the school had an enrolment of 1004 students with 85 teachers (79 full-time equivalent) and 51 non-teaching staff (33 full-time equivalent). It also has two university campuses, Central Queensland University. Gladstone was also formerly home to CQIT (TAFE) Gladstone Campus, before it combined with Central Queensland University, becoming the Gladstone City Campus. The Gladstone Regional Council operates Gladstone Library at 39 Goondoon Street, Gladstone. The Gladstone branch of the Queensland Country Women's Association meets at the QCWA Hall at 88 Oaka Lane, Gladstone Central. Gladstone has direct access to Heron Island, Wilson Island, Curtis Island and other islands from the marina and local airstrips. Boyne Island and Tannum Sands have grown in popularity because of their beautiful beaches and relaxed lifestyle. The Millennium Esplanade is a big attraction where there are lots of shelters, barbecues and walking paths, and long stretches of beach. Boyne Island and Tannum Sands are not part of the Gladstone township but are part of the Gladstone region and formerly part of the Calliope Shire. A little further afield (25 km south of Gladstone) is Lake Awoonga. The recreation area has free barbecues, swimming, landscaped walking trails, as well as a caravan park. The lake has been stocked with several fish species since 1996, and over 2 million barramundi have been released. In addition to the fishing, Lake Awoonga has many natural attractions, especially the wildlife, with more than 225 species of birds (or over 27% of Australia's bird species) found in the region. Lake Awoonga is also the primary source of Gladstone's water supply. Awoonga dam is not part of the Gladstone township but is part of the Gladstone region and formerly part of the Calliope Shire. 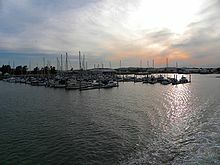 Gladstone is located within the federal electoral division of Flynn, a marginal seat currently held by the Liberal National Party of Queensland's Ken O'Dowd in Federal elections, and the state electoral district of Gladstone, held by the ALP's Glenn Butcher. The Dawson Highway originates in Gladstone, and it runs westwards for approximately 400 km (250 mi) to Springsure. Gladstone is a major stop on the North Coast railway line, with long-distance passenger trains operated by QR Traveltrain stopping in the area. Gladstone is also the transshipping point for export coal from the Moura and Blackwater coal basins and is one of the largestest coal export ports in The Southern Hemisphere. Currently, coal trains of up to 1.7 kilometers in length and 10,600 tonnes gross weight are run by rail operators Aurizon and Pacific National to unload at coal terminals at Barney Point, Clinton, and Yarwun. Domestic coal is also railed to the Gladstone Power Station and the Queensland Alumina Limited refinery. An extensive rail facility is located at Callemondah to support these operations. Gladstone was also a major terminus for rail freight and bulk fuel, with extensive marshaling yards at Gladstone, South Gladstone, and Auckland Point. As is the case in much of Queensland this traffic, declining from the 1990s, has now ceased with goods carried by road. Gladstone Airport is located in the western suburbs of Gladstone about 6 km (3.7 mi) (8 minute drive) from the centre of the city. The main provider of scheduled passenger air services has been Qantaslink, using mostly Boeing 717 aircraft though Flight West Airlines and Ansett also previously offered service. Strategic Airlines briefly offered services in 2011 and Virgin Australia commenced flights in October 2011 and now offers up to 6 return flights a day to Brisbane mostly on ATR 72 aircraft with Embraer 190 and Boeing 737 also a regular appearance in the schedule. New players JetGo started flying direct services from Sydney in December 2014. The service was offered twice daily, in 36 seat Embraer 135LR jets but ceased in February 2015. In May 2009, a $65 million upgrades to the airport and nearby area was undertaken, which reached completion in 2011. The Port of Gladstone is Queensland's largest multi-commodity port and the fifth largest multi-commodity port in Australia. It is the world's fourth largest coal exporting terminal. Gladstone's daily newspaper is The Observer, which is owned by APN News & Media and is issued each morning from Monday to Saturday. Gladstone also has a free weekly independent community newspaper called Gladstone News. 4CC is Gladstone's local AM commercial radio station, owned by Grant Broadcasters. 4CC has one full-time announcer based in Gladstone to present the station's local breakfast show. The station broadcasts to Central Queensland on four separate frequencies via three AM transmitters in Gladstone, Biloela and Rockhampton, and a FM translator in Agnes Water on the Discovery Coast. Hit Central Queensland is Gladstone's local FM commercial radio station, owned by Southern Cross Austereo. Hot FM has two full-time announcers based in Gladstone to present the station's flagship weekday breakfast program, which is also broadcast to Rockhampton and Emerald. Gladstone also receives radio stations that carry local programming from Rockhampton including commercial radio stations Triple M Central Queensland and 4RO. Triple M broadcasts on a separate FM frequency in Gladstone. ABC Capricornia also broadcasts into Gladstone from Rockhampton, using a separate FM frequency. Until November 2014, ABC Capricornia maintained a local news bureau in Gladstone where a local journalist was based to cover the Gladstone region. Some local news bulletins on ABC Capricornia were also broadcast live from Gladstone. However, in what was a controversial decision, the ABC's Gladstone office was permanently closed in late 2014 as a cost-cutting measure following the Federal Government's decision to withdraw $254 million in funding to the ABC. 91.9 Fresh FM is Gladstone's local community radio radio station, which has a Christian radio format. WIN Television, Seven Queensland, Southern Cross Ten, ABC and SBS stations are all able to be received in Gladstone. The Central Queensland editions of WIN News and Seven Local News, both regularly feature news content directly relating to the Gladstone region. Seven Queensland employ a journalist and camera operator in Gladstone, while WIN Television dispatch a news crew from Rockhampton to cover news stories in Gladstone. The weekly 'What's On' segment on Seven Local News is also presented from Gladstone. Football (soccer) / Gladstone Senior Mens: Central SC, Clinton FC, Gladstone United FC, Meteors FC, Yaralla FC. William Robert (Bill) Golding (1890–1985) — builder, historian, local government councillor, local government head, public servant, public service head. Percival Albert Gourgaud (1881–1958) — public servant, public servant head. Henry John (Jack) Manning (1889–1978) — company managing director, journalist, newspaper executive, newspaper owner. Hayley Marsten (1994-) - awarded country singer/songwriter. Frederick Woolnough Paterson (1897–1977) — barrister, communist, farmer, local government councillor, Member of Lower House, school teacher, soldier. ^ a b Australian Bureau of Statistics (27 June 2017). "Gladstone (Urban Centre and Locality) (State Suburb)". 2016 Census QuickStats. Retrieved 25 April 2018. ^ "Gladstone (entry 13860)". Queensland Place Names. Queensland Government. Retrieved 21 June 2014. ^ "Tindale Tribes - Tulua". samuseum.sa.gov.au. South Australian Museum. Archived from the original on 12 April 2015. ^ "Tindale Tribes - Goeng". samuseum.sa.gov.au. South Australian Museum. Archived from the original on 29 October 2016. ^ a b Kirkpatrick, Rod (2000). "Manning, Henry John (Jack) (1889–1978)". Australian Dictionary of Biography; adb.anu.edu.au. Australia National University. Archived from the original on 15 March 2017. Retrieved 13 March 2017. ^ "Local Heritage Register: Historical Context" (PDF). gladstone.qld.gov.au. Gladstone Regional Council. Archived (PDF) from the original on 14 March 2017. Retrieved 13 March 2017. ^ MacGillivray, John. "Narrative of the voyage of H.M.S. Rattlesnake, commanded by the late Captain Owen Stanley during the years 1846-50, including discoveries and surveys in New Guinea, the Louisiade Archipelago, etc". openlibrary.org. Archived from the original on 28 September 2017. Retrieved 28 September 2017. ^ a b c d e f g "Opening and closing dates of Queensland Schools". Queensland Government. Retrieved 18 April 2019. ^ "The oldest state primary schools in Queensland". education.qld.gov.au. Archived from the original on 23 January 2018. Retrieved 23 January 2018. ^ "Gladstone Central State School, Block B (entry 602001)". Queensland Heritage Register. Queensland Heritage Council. Retrieved 1 August 2014. ^ "'Mr Gladstone' Sculpture History". gragm.qld.gov.au. Gladstone Regional Art Gallery & Museum. Archived from the original on 14 March 2017. Retrieved 13 March 2017. ^ "Agency ID5242, Gladstone South State School". Queensland State Archives. Retrieved 1 July 2014. ^ "News in Brief". Queensland Times, Ipswich Herald and General Advertiser. Qld. : National Library of Australia. 10 August 1899. p. 2. Retrieved 1 July 2014. ^ "Cyclone moves west fast". The Courier-Mail. Brisbane: National Library of Australia. 4 March 1949. p. 1. Retrieved 24 June 2014. ^ "GladstoneSHS". Archived from the original on 2 February 2017. Retrieved 29 January 2017. ^ "Gladstone West SS". Archived from the original on 2 February 2017. Retrieved 29 January 2017. ^ "Clinton SS". Archived from the original on 2 February 2017. Retrieved 29 January 2017. ^ "About Us". Trinity College. Archived from the original on 10 November 2018. Retrieved 10 November 2018. ^ Cooley, Declan (22 July 2016). "Lutheran exodus to hit Trinity: 216 children will need classroom places". Gladstone Observer. Archived from the original on 10 November 2018. Retrieved 10 November 2018. ^ Cooley, Declan (21 July 2016). "UPDATE: Parents 'regretful' Gladstone school will close at end of year". Gladstone Observer. Archived from the original on 10 November 2018. Retrieved 10 November 2018. ^ "Public Libraries Statistical Bulletin 2016-17" (PDF). Public Libraries Connect. State Library of Queensland. November 2017. p. 13. Archived (PDF) from the original on 30 January 2018. Retrieved 24 January 2018. ^ "Gladstone Central State School, Block B (entry 602001)". Queensland Heritage Register. Queensland Heritage Council. Retrieved 8 July 2013. ^ "Glengarry Homestead (entry 600386)". Queensland Heritage Register. Queensland Heritage Council. Retrieved 8 July 2013. ^ "Our Lady Star of the Sea Church & School (entry 600521)". Queensland Heritage Register. Queensland Heritage Council. Retrieved 8 July 2013. ^ "Port Curtis Sailing Club Clubhouse (entry 602711)". Queensland Heritage Register. Queensland Heritage Council. Retrieved 8 July 2013. ^ "Gladstone Post Office (former) (entry 601331)". Queensland Heritage Register. Queensland Heritage Council. Retrieved 8 July 2013. ^ "Kullaroo House (entry 601330)". Queensland Heritage Register. Queensland Heritage Council. Retrieved 8 July 2013. ^ "Commonwealth Bank Building (former) (entry 601338)". Queensland Heritage Register. Queensland Heritage Council. Retrieved 8 July 2013. ^ "Gladstone Regional Art Gallery and Museum (entry 601333)". Queensland Heritage Register. Queensland Heritage Council. Retrieved 8 July 2013. ^ "Fig Tree (entry 602385)". Queensland Heritage Register. Queensland Heritage Council. Retrieved 8 July 2013. ^ "Port Curtis Co-operative Dairy Association Ltd Factory (former) (entry 601334)". Queensland Heritage Register. Queensland Heritage Council. Retrieved 8 July 2013. ^ "Gladstone Court House (entry 601332)". Queensland Heritage Register. Queensland Heritage Council. Retrieved 8 July 2013. ^ "Saiki Sister City". Gladstone Regional Council. Archived from the original on 10 April 2013. Retrieved 13 March 2013. ^ "Climate statistics for Gladstone AWS". Australian Bureau of Meteorology. June 2011. Archived from the original on 27 April 2009. Retrieved 11 May 2009. ^ a b "Mystery carrier causing a buzz". Gladstone Observer. APN News & Media. 3 December 2010. Archived from the original on 4 December 2010. Retrieved 5 December 2010. ^ "History of Gladstone Ports Corporation". Port of Gladstone. Archived from the original on 20 October 2011. Retrieved 5 December 2010. ^ "Orica Mining Chemicals Sodium Cyanide". Orica Limited. Retrieved 13 March 2013. ^ "Orica Yarwun Our Operations". Orica Limited. Archived from the original on 10 April 2013. Retrieved 13 March 2013. ^ "Gladstone Ports Corporation: Trade Statistics". Port of Gladstone. Archived from the original on 1 December 2009. Retrieved 5 December 2010. ^ a b "Great Barrier Grief: A small port benefits and suffers from the boom". The Economist. 2 June 2012. Archived from the original on 19 October 2015. ^ Williams, Brian (17 September 2011). "Warning: Gladstone fish off the menu and central Qld coast closed to fishing". The Courier Mail. News Queensland. Archived from the original on 10 June 2012. Retrieved 31 May 2012. ^ Andree Withey, Francis Tapim and Paul Robinson (8 November 2011). "Government defends probe into Gladstone's sick fish". ABC News. Australian Broadcasting Corporation. Archived from the original on 22 May 2012. Retrieved 31 May 2012. ^ "Annual Report 2017" (PDF). Gladstone Central State School. Archived (PDF) from the original on 10 November 2018. Retrieved 10 November 2018. ^ "Annual Report 2017" (PDF). Gladstone West State School. Archived (PDF) from the original on 10 November 2018. Retrieved 10 November 2018. ^ "Annual Report 2017" (PDF). Gladstone South State School. Archived (PDF) from the original on 11 November 2018. Retrieved 11 November 2018. ^ "Annual Report 2017" (PDF). Clinton State School. Archived (PDF) from the original on 10 November 2018. Retrieved 11 November 2018. ^ "Annual Report 2017" (PDF). Kin Kora State School. Archived (PDF) from the original on 11 November 2018. Retrieved 11 November 2018. ^ "Annual Report 2017" (PDF). Rosella Park School. Archived (PDF) from the original on 11 November 2018. Retrieved 11 November 2018. ^ "Annual Report 2017" (PDF). Gladstone State High School. Archived (PDF) from the original on 11 November 2018. Retrieved 11 November 2018. ^ "Annual Report 2017" (PDF). Toolooa State High School. Archived (PDF) from the original on 11 November 2018. Retrieved 11 November 2018. ^ "Gladstone Library". Public Libraries Connect. State Library of Queensland. 30 August 2016. Archived from the original on 24 January 2018. Retrieved 24 January 2018. ^ Gladstone Regional Council Website 2011 Archived 29 March 2011 at the Wayback Machine. Gladstone.qld.gov.au. Retrieved on 18 August 2011. ^ David Sparkes (29 July 2011). Strategic Pulls out of Gladstone Archived 6 October 2011 at the Wayback Machine. The Observer. Gladstone Newspaper Company. Retrieved 13 March 2013. ^ Media Release: Opening marks a milestone in region's history Archived 21 March 2012 at the Wayback Machine. None. Retrieved on 18 August 2011. ^ ABC to close Gladstone radio post Archived 6 August 2016 at the Wayback Machine, The Observer, 24 November 2014. Retrieved 16 November 2016. ^ City leaders disappointed by ABC closure Archived 6 August 2016 at the Wayback Machine, The Observer, 25 November 2014. Retrieved 16 November 2016. ^ "Golding, William Robert (Bill)". Australian Dictionary of Biography; adb.anu.edu.au. Australia National University. Archived from the original on 30 March 2015. ^ "Gourgaud, Percival Albert". Australian Dictionary of Biography; adb.anu.edu.au. Australia National University. Archived from the original on 3 April 2015. Retrieved 30 March 2015. ^ "Paterson, Frederick Woolnough". Australian Dictionary of Biography; adb.anu.edu.au. Australia National University. Archived from the original on 18 May 2013. ^ Svendsen, Mark (30 January 2009). "Val Vallis: With a song in his heart". The Australian. Retrieved 9 April 2016.